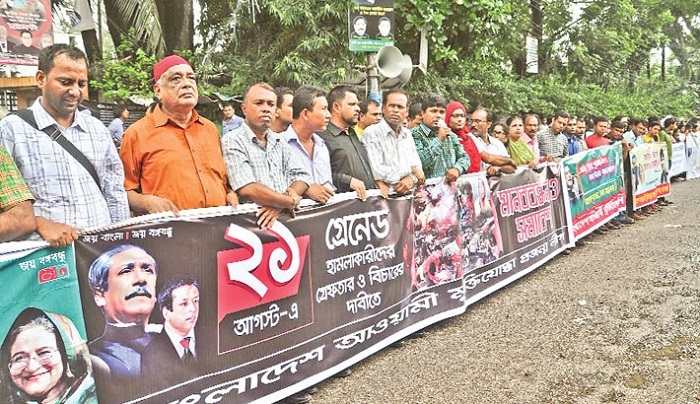 Thousands of leaders and activists of the ruling 14-party alliance on Monday linked their hands in a human chain protest from Gabtoli to Jatrabari in the city to denounce BNP Chairperson Khaleda Zia’s controversial remarks about the number of 1971 martyrs. The protest by the Awami League-led political alliance was also for creating political campaign against Pakistan’s interference in Bangladesh’s domestic issues including the ongoing war crimes trial. The protest however created traffic congestion across the city after it started at 4 pm, UNB reports. Health Minister and Awami League’s Presidium Member Mohammad Nasim meanwhile announced during Monday’s protest that the alliance would organise similar human chain programmes in all district headquarters on February 24 for same causes. He made the announcement when he addressed the supporters at Bangabandhu Square in the capital. Nasim said Pakistan could not forget their defeat in 1971, and when Prime Minister Sheikh Hasina moved to try the war criminals, Pakistan started interfering in the internal matter of Bangladesh. “We requested Pakistan to refrain from interfering”, he said. Urging Khaleda, the Health Minister said: “Stop conspiracy and forget Pakistan. You (Khaleda) should be made accountable for your controversial remarks about the number of 1971 Liberation War martyrs”. Meanwhile, Agriculture Minister Matia Chowdhury criticised Khaleda for her destructive politics of arson for 92 days during a non-stop transport blockade programme last year to demand ouster of the government and an early election. Matia said Khaleda returned to her Gulshan house from office later, conceding a defeat and humiliation as people did not respond to her call of transport blockade. During more than 90 days of violent campaign up to 150 people died across the country last year. “Then Pakistan gave her life support by asking her to question the number of 1971 Liberation War martyrs, and the BNP Chairperson and her party men accepted that doctrine,” she said. “When she (Khaleda) was the Prime Minister, she mentioned the numbers of the martyrs exactly but now she is questioning it”, said Matia. “You better go to Pakistan. We will never allow you to destroy peace in Bangladesh”, she said.